Our medium platter contains Twelve 7” subs of your choosing, Lettuce and Tomato (please specify if you want this on the side) and a bottle of Beano’s Sub oil. Serves 12 to 16 people. Price includes tax. 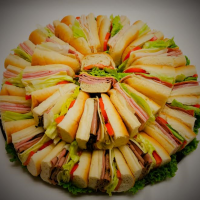 Our large platter contains Sixteen 7” subs of your choosing, Lettuce and Tomato (please specify if you want this on the side) and a bottle of Beano’s Sub oil. Serves 16 to 20 people. Price includes tax.